Savage Opress CW55. Zoom in on the photos to ensure you are happy with the condition. SAVAGE OPRESS. THE CLONE WARS. CALIFORNIA RESIDENTS ADD 8.0 %. THE CLONE WARS # CW55. SAVAGE OPRESS. 2011 HASBRO - STAR WARS. I DO THE BEST ON INFORMING ABOUT ANY PRODUCT SPECIFICATIONS AND PRODUCT'S CONDITION. This listing is for a used Star Wars figure.Check Picture for accessories included. 3.75" Savage Opress. We know you will enjoy it too. Sealed, Never Opened. This is a GREAT ITEM! FREE image hosting (including. ). SAVAGE OPRESS. THE CLONE WARS COLLECTION. MANUFACTURED: 2011 Hasbro. Boy Boba Fett. Steevosig’s Toy Galaxy. Star Wars the Clone Wars SAVAGE OPRESS CW3 new on card Hasbro out of production and hard to find. Condition is New. Shipped with USPS First Class Package. International shipping will be more. All sales final. Please feel free to ask any questions you might have about this item. Thank you for looking! 1:6 Savage Opress (Star Wars) Limited Edition by Frost Vision Studio. CustomLimited Edition (Only 22 hand-signed pieces) 1/6 Scale Savage Opress (Star Wars) by Frost Vision Studio. PAINTED VERSION ONLY, VERY FEW LEFT! Locally pick up is available and it's always FREE ! Star Wars Savage Opress The Clone Wars Action Figure . Condition is New. Dispatched with Royal Mail 2nd Class. Star Wars The Clone Wars 2011 Animated Series Savage Opress. Condition is New. Dispatched with Royal Mail 2nd Class. 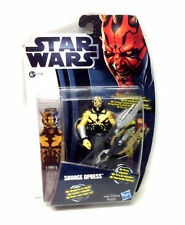 A Superb chance to pick up this hard to find STAR WARS Clone Wars SAVAGE OPRESS. Savage Opress. THE BATTLE FOR THE GALAXY CONTINUES. WARNING THIS IS FOR AGE 4 . Star Wars Clone Wars SAVAGE OPRESS With double lightsaber Hasbro 2010. Condition is Used. Brand new in original packaging Will be sent in a free protective case Well packed! Due to the nature of our goods being used, mistakes can happen. We Do Not Honour ?. We check our competitors?. Retro Toys. Retro Collectables. None of our toys are suitable for children under 36 months due to small parts. Never been played with just displayed. Star Wars Clone Wars CW59 Savage Opress Import ! Clone Wars CW59. SAVAGE OPRESS. Including many hard to find and exclusives. From 1995 - 2010. Star wars tcw savage opress 2012. Your choice of how much you want spend on cover. Extra cover is optional. Star Wars The Clone Wars Action Figure. Savage Opress With Weapon. Marked Hasbro 2010. Maybe Missing Parts. Comes In Good Played With Condition. Very Collectable. Sold Ask Seen. PLEASE NOTE THAT POSTING WILL BE ON A SATURDAY MORNING DUE TO WORK COMMITMENTS. Many Thanks. And get one FREE! MIX N MATCH.Add any.